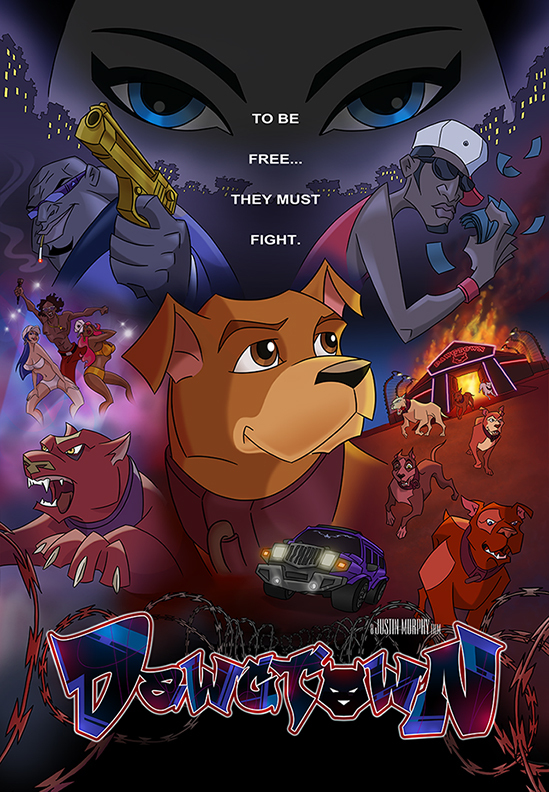 Dawgtown is a work-in-progress feature film created with traditional 2D animation. It tells the story of Max, a young pit bull who is separated from his owner and forced into the brutal world of Dawgtown, where underground dog fights are arranged. In Dawgtown, Max meets other dogs, including Athena the two-time champion, and Mauler ("the meanest battledog in the pit"). Athena sees something different in Max, and together they plan a revolution, with the hope of breaking out of Dawgtown and finding a better life. The project's creator, Justin Murphy, has animated several shots in the opening sequence, and pencil-tested and storyboarded others. He is now seeking crowdfunding on Indiegogo, to hire actors to record the film's dialogue, and storyboard the rest of the film. With six days to go, the project has received $10,092 in pledges, of a goal of $10,000. "$10,000 will cover for all Concept Art/Storyboards to be completed, as well as some finished animation for select scenes." Good for them, it sounds like a realistic (low budget) wage for 1 storyboard artist at least. Like 20 weeks of work/$500 week to storyboard a feature. Last time I did such work, it was 4-6 weeks to board 35 pages of a 110 page script. Or like, a page a day. Something in that ballpark. This could go either way. Any way. Not sure I could support something that uses "dawg." There's actually a big problem with dog fighting in South Africa at the moment. Disturbing stuff.